Both of GreenArrowTV’s reviewers are taking on last week’s Arrow season finale! You can read Derek B. Gayle’s review here. 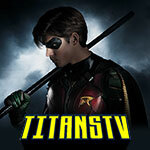 Summary: A satisfying season finale less about cliffhangers than about wrapping up a hero’s origin and marking the next evolution of his life and the lives of those around him. On the clock with Waller and awaiting any response from Roy to the Mirakuru cure, Slade’s soldiers attack Team Arrow in the clocktower. Roy springs to life, cured, and the team manages to escape, with Lyla Michaels offering a bit of assistance. The team regroups at the foundry to assemble a number of injection arrows with the cure. 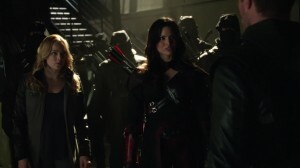 Sara arrives with Nyssa al Ghul and a legion of League assassins in tow. Though they are ready to kill, Oliver insists that no one die. Roy is given his own mask, and during prep he calls to check on Thea. At the train depot, Thea has just shot Malcolm, who jumps back up and reveals he was wearing Kevlar. He offers to take her under his wing, but she refuses to listen to him. Thea agrees to meet with Roy, but Malcolm warns her that he will betray her trust, too. At the police precinct, Lance attempts to fend off one of one of the Mirakuru goons but he’s tossed aside and Laurel is kidnapped. Roy meets with Thea are his place and they plan to run off together, right after Roy helps Team Arrow storm Slade’s hideout to take him down, which he hides from her and lies about having anything to do with the Arrow. 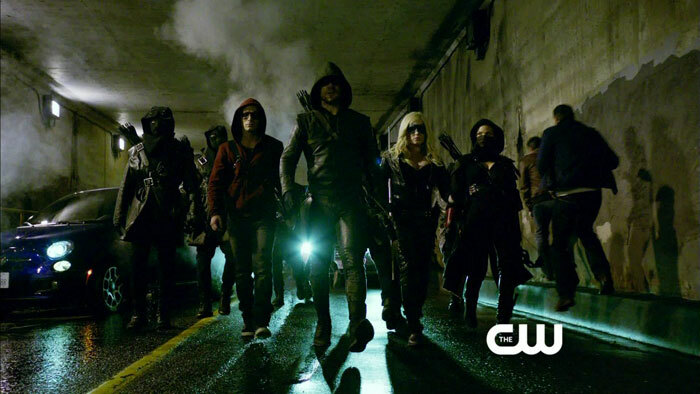 Arrow, Canary, Roy, Nyssa, and the assassins confront the Mirakuru army in a tunnel on the way to Queen Consolidated, and eventually win with Lance’s help. Meanwhile, Diggle and Lyla storm A.R.G.U.S. and free Suicide Squad members, including Deadshot, to make a run at Waller to get her to stop the drones from attacking the city, and Dig learns Lyla is pregnant. The Arrow’s army attacks Slade at the office, but he manages to get away. Nyssa kills Isabel and suggests Oliver start doing the same. Felicity convinces Oliver that he needs to out-think Slade to win. He takes Felicity to the Queen Mansion, knowing that the place is still wired with cameras for Slade to see. He professes his love for Felicity, rightfully assuming Slade will come for her to live up to his promise to kill the woman he loves most. 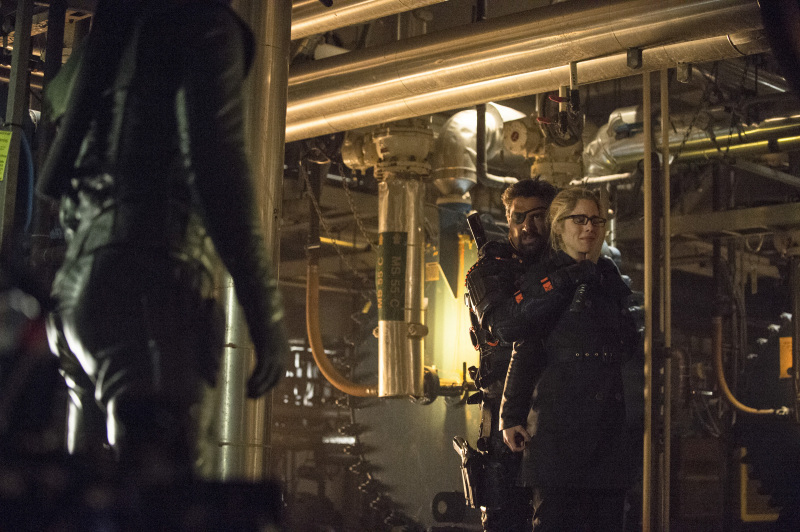 It’s a ruse, as Oliver has used Felicity to get close to Slade to inject him with the cure. They engage in a violent final struggle as Waller commands the drones to the attack the city. In the past, Oliver tries to convince Slade to deal only with him, not inject others with Mirakuru, and to let Sara go, which he won’t. After waiting two hours, Anatoly fires a torpedo at the Amazo, freeing Oliver. As the ship begins to sink and Sara is sucked out into the ocean, seemingly to her death, Oliver and Slade square off. 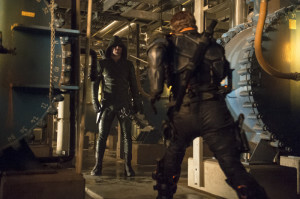 An explosion traps Slade under some metal and Oliver has the chance to either kill his friend or save him. Slade insists that he will kill everyone Oliver loves, even if cured, so Oliver slams an arrow into Slade’s right eye. In the present, Slade insists that Oliver is going to have to kill him to stop him, but that it won’t matter because the drones will destroy the city and Slade will still win. Oliver manages to capture Slade alive and contacts Waller to call off the drones, which she does. While packing Roy’s things, Thea discovers his bow and arrows and leaves him. She runs off to join Malcolm. Lance and Laurel say goodbye to Sara, who has decided to return to the League of Assassins. As the walk off, Lance falls to the ground, dying from internal injuries suffered from the goon earlier. 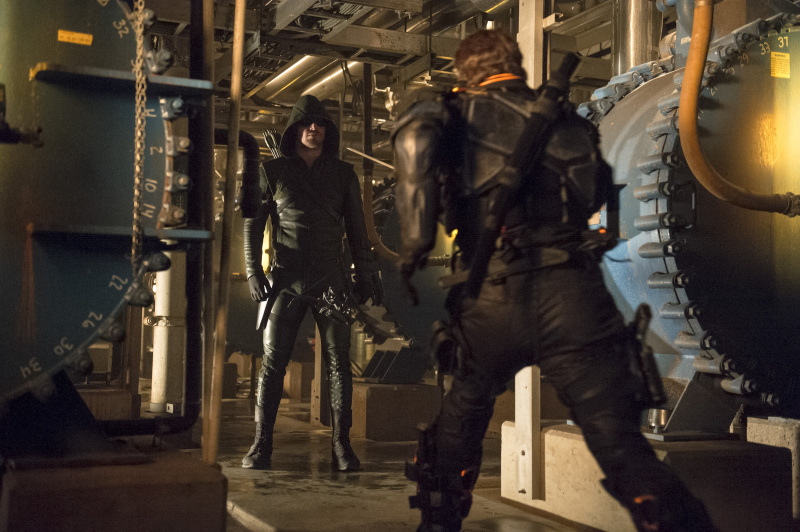 Oliver traps Slade in an A.R.G.U.S. 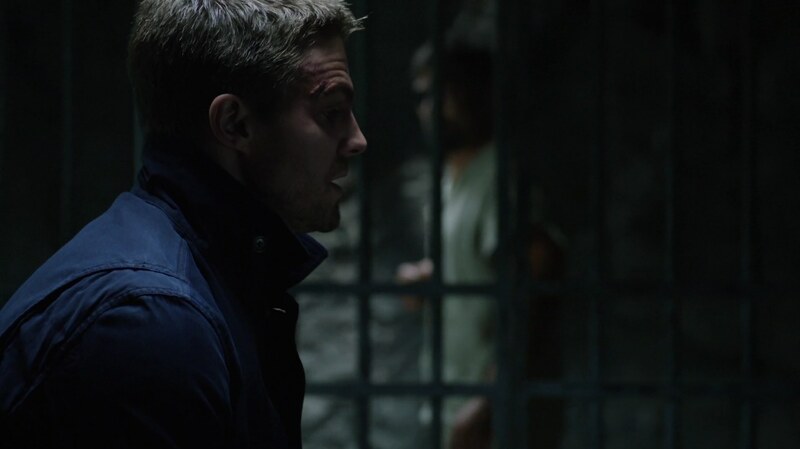 prison cell buried beneath the ground on Lian Yu, telling him that in beating him without killing, Slade helped Oliver become a hero. In the past, Oliver is knocked unconscious by a final explosion on the boat. He wakes up in a bed and greeted by some Chinese heavies. They take him to a car outside and Oliver meets Amanda Waller for the first time … in Hong Kong. Exactly as sold, in every way possible. The second season capper is an interesting beast in that it really only offers us one genuine shocker of a moment — with a few other more minor surprises — and yet absolutely everything is fulfilling and entertaining. There isn’t a beat that felt out of place, a development that didn’t feel earned, nor a moment that didn’t keep ones eyes glued to the screen. Most important, just as was described by the Exec Producers in their slew of media interviews leading up to this finale, this really is the close of a two-year opening chapter. Whether he adds a colorful adjective to his nom de guerre next season or not, Oliver the vigilante is done and Arrow the hero stands firmly in his place. The most striking sequence of the hour was the single most defining of this first two years: the showdowns between Oliver and Slade in both the past and the present. The conception of writers Berlanti, Guggenheim, and Kreisberg, the execution of director Behring, and the crafting of editor Andi Armaganian was a dazzling volley between both time periods, an intercut meant to evoke bookends to this specific thread of Oliver’s life. In both, he was presented with the choice of saving or ending Slade, a choice that was as much about Oliver’s own life and soul as it was his friend’s. What’s most compelling about this in the past timeline is that Oliver makes the choice here. Since Oliver revealed to Team Arrow that he chose to kill Slade in the past rather than cure him, the thought was that he would head into a final showdown with his friend and mentor in the past with the pure intention of taking him out. What we saw play out here and in “Streets of Fire” last week was far from that case. Up to the very end, Oliver was resolutely focused on saving Slade from his altered state, his anger, himself. It’s the kind of emotional truth and depth of the series that often gets overlooked in favor of the superhero trappings, the romantic entanglements, and the network affiliation. In fact, quite possibly the best scene of an hour chocked full of good ones is that final exchange between Oliver and Slade in the Lian Yu A.R.G.U.S. prison facility. After everything that had gone down, after all the turmoil, and the devastation, and the valuable things Slade had stripped away from him, Oliver still cares much for this brother with whom he went through a daunting crucible. More important, he cares enough about his own journey to recognize exactly where it has brought him, a breakthrough to finally leave those darker aspects of his past behind and embrace the light as a hero. That Oliver went the whole episode without killing a single person was commendable and impressive, and was summed up beautifully in his kiss-off speech to Slade. Sure, there was a moment after the first attempt to hit Deathstroke with the cure at Queen Consolidated where Oliver went right back on all of his character development this year and immediately saw the death of Slade Wilson as the one and only answer to his problems. Until, of course, Felicity snapped him back. That one momentary doubleback was par for the course for the hero monomyth, the brief rejection of path and destiny, losing sight of what he’s learned about himself right before the final battle that requires him to put those lessons into practice. We’ve touched on it on a number of occasions before, but one of the best things that Arrow gets right as a series is the fact that its hero is not infallible. Oliver makes mistakes, he gets blinded by his own short-sightedness, he can be bull-headed, and more often than not he pays for those missteps. 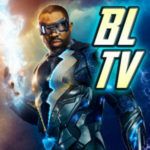 Many people clamor for superhero television series to actually feature superheroes — The Flash is coming for ya, folks — but one of the key factors in choosing to base a series on one of the non-powered heroes of the DC Universe is to really allow the focus to be on the character as a human being. Why people relate so much to a Batman or a Green Arrow is because, even with all of the extraordinary wealth and training, these are heroes most people have the potential to be. Their struggles, the world-exploding kind aside, tend to be small-scale and human, and that makes for tremendous appeal and material for a continuous series. In fact, one of the strongest runs of Green Arrow’s career in the comics was in The Longbow Hunters, where artist and writer Mike Grell shipped Oliver and Dinah off to Seattle, scrubbed out all of the superhero tropes, and left GA to his human foibles amidst a dark world of very human crime. It’s one of the key runs that informs this very TV series, and it’s why this interpretation of Oliver Queen is so successful. SLADE: Oh, you’re a killer. I know, I created you. You’ve killed plenty. OLIVER: Yes, I have. You helped turn me into a killer when I needed to be one. And I’m alive today because of you. I made it home because of you. And I got to see my family again. OLIVER: But over the past year, I’ve needed to be more, and I faltered. Then, I stopped you … without killing. Another beat. 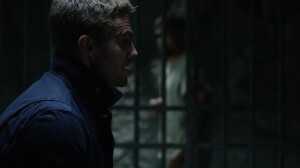 Oliver stands and steps up to the bars in front of Slade. OLIVER: You helped me become a hero, Slade. Thank you. Oliver is quite often quick to place blame on himself and take the weight of the world on his shoulders like Atlas, sometimes justified, sometimes not. But that he has faults and he recognizes and acknowledges them to overcome, whether he’s always successful or not, is what makes this one of the most compelling superhero adaptations around. He’s not a god, he’s not a saint. He has limitations and issues to work through, but he does and that makes him heroic. The above exchange is a perfect summary of Oliver’s first two years as the Arrow. Maybe it wasn’t the ultimate showdown to the death everyone expected or many were looking for, but it’s the showdown and resolution we all needed. Getting back to Oliver’s choice, specifically the one in the past, it’s exceptionally fascinating because that was the switch. Much like the character of Lincoln Hawk(s) turning his trucker cap backwards in the cornball ’80s winner (and ode to competitive arm wrestling) Over the Top, this was the moment that solidified Oliver into the man we’d see come back to Starling City two years ago. Yes, he’d killed before, he’d fought insurmountable and gruesome odds, and events, particularly traumatic ones, compound into a collective whole. Sure, we’ve got three more years of story of Oliver building alliances, learning skills, and suffering new tragedies that will solidify the Arrow that we’ll come to know. This, though, is the moment when Oliver made killing his first choice, his go-to response to threat. Consider me thoroughly shocked to see everything come down to one final minute, an arrow in one hand, a syringe in the other, Slade spewing on about how he’ll destroy everyone Oliver cares about in his life, even if cured. It’s such a simplistic juncture but a poignant one. The whole fight sequence, again coupled with the intercut fight in the present, was beautifully brutal and well-choreographed, a sinking ship a perfect visual metaphor. The skewering through the eye was a bit different than anyone expected, but it was just as powerful as could be thought and offered a great counterpoint to Oliver’s choice in the present to do the exact opposite and preserve Slade’s life. Not for nothing, Oliver didn’t walk away from his act. Almost instantly, he’s knocked from his feet and unconscious into the water, a sort of baptism into a new story that begins the moment he wakes in the bed in Hong Kong. And certainly, his action isn’t without consequence, spurring on the entirety of this season’s story. That present choice, of course, was set up by Oliver and Felicity in one of the most devious ploys of the series, both in-story and against the viewing audience. The undeniable chemistry between actors Amell and Rickards has built its own cottage industry amongst the fandom of the show, and the showrunners are keenly aware of it. Whether you subscribe to #Olicity or not — again, though there is great chemistry there, I can’t help but feel a more chaste, respectful love of caring rather than anything long-term romantic — the show hasn’t been afraid to both offer and play on moments of that facet throughout the season. This, though, has to have been the most egregious, and it’s a rather controversial choice on the writers’ parts. It runs a razor’s edge of alienating that very vocal subset of the fandom, while also giving them a strong taste of that for which they’ve been roaring. When exec producer Marc Guggenheim shared a single line of dialogue from the finale on Twitter, “I love you,” it got a number of people frothing, finally expecting to hear Oliver say those three magic words to his girl Friday. The assumption seemed to make sense, but I have to admit that it seemed like such an obvious bit of fan service that I was somewhat dreading hearing the line in the episode, in addition to thinking that they likely wouldn’t be so obvious. Yet, once the scene at the mansion played out, one couldn’t help but buy into it, and my jaw actually dropped a bit. Frankly, it was quite puzzling. 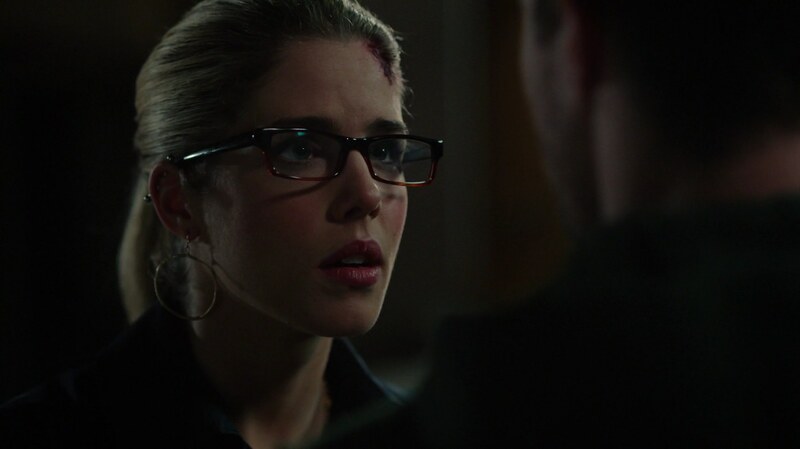 Something, honestly, didn’t feel right about it, and as subsequent scenes started to play out, one very cruel thought took to my brain: Oliver just set Felicity up as live bait. He truly was going to do the unthinkable here by putting her in harm’s way as a means to draw Slade out and hope that he could defeat his adversary before Felicity was hurt or worse. Not only had the writers used the Olicity movement to play on audience expectation and desires, but they were potentially setting IT Girl up as the cost for Oliver’s arrogance. It was a rather stunning and somewhat off-putting realization that, thankfully, was refuted not too long afterward. That Felicity was in on the deception in order to get close to Slade to inject him with the cure was a stroke of genius. Well, in on it the moment Oliver slipped her the syringe, at least. The ploy was essentially very cruel, though, to those who thought they’d finally received the present for which they’d waited with baited breath for nearly two years. One hand wants to tip a hat to such a bold and calculated move, while the other anticipates the potential backlash. Speaking of backlash, inexplicably, one of the more divisive aspects of the series is the Lance family, which by my book is as important to the Oliver Queen mythos as his hood and bow. The family gets prominent space in the finale, even if each member gets slightly short shrift. One of those aforementioned minor surprises is that Sara got to live. Roundly expected to give her life to the cause, it was more than a pleasant surprise to see her survive the night, even if her choice to rejoin the League of Assassins is a bit hard to stomach. It’s apparent that she believes she can solve her problems by heading right back to the root and sort them out there. If there’s one way to write her off of the series, for the time being at least, this one is both smart and welcome. Sara and her portrayer Caity Lotz each soundly earned their place in the series over the season, which is a complete shift from the rather unwelcome introduction of her in the season’s first month. Sending her out in a body bag, though they’d built up a redemption story for her, would’ve seemed a bit distasteful and gratuitous. Even better is that she’s birthed a tradition of the Canary as a hero in Starling City, and it’s quite clear that handing her leather jacket over to her older sister was a pretty blunt passing of the torch. Sara is sure to be back in some capacity in the series, and the potential to see her next iteration of assassin or perhaps something attempting to be more transformative for the League is alluring. Much of that is built around her relationship with Nyssa, which, despite being spoiled in promos and press materials, is put to good use this outing. Whether or not they are or will be romantically linked, there is a strong tie between the two, and Sara was able to leverage that to help Oliver. 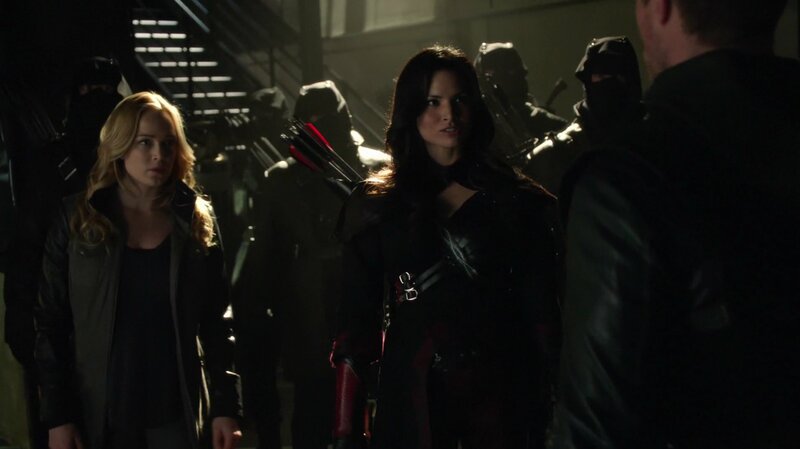 That not only gave the Arrow an army — and one well versed in archery to carry out the inoculation plans — but gave the audience a fun bit of business over the contrasting styles of Team Arrow and the League. As a site, we’ve been accused of having some kind of Laurel bias, which one can’t help but find humorous. If you look back to our reviews and coverage of Laurel over the last two years, in particular our roundtable series (postseason) from last year, you’ll find that the majority of us felt that Laurel was the least likable and least developed of the characters. We were sadden because actress Katie Cassidy had proven spritely and game in past roles, giving a strong expectation of how well the character would be handled. Plus, of course, she is the second credited lead on the series after star Stephen Amell. This made our disappointment with Laurel all the more pointed last season, yet there was hope that somehow they would be able to correct course with her this season. It started fair enough, pitting Laurel against the Arrow, but they managed to burn through that story in a few episodes and suddenly she was cast adrift yet again. The chemical dependency storyline at midseason was hit-or-miss, which seems to have caused many to write Laurel off. That’s unfortunate because in learning the truth of Oliver’s double life they were able to give Laurel some direction and some heft as a character. She’s all but relegated to the sidelines during this finale, but that’s mostly in service to closing Sara’s chapter to allow the next phase of Laurel’s life to begin. I, for one, feel there’s a good foundation that was laid in the last third of the season to start building Laurel’s life as Black Canary. What’s a hero origin story without the death of a parent? In the media fracas prior to the finale, the EPs pointed out that at least one of the characters would not be seen on the series at the start of next season when answering the question about possible deaths. They generally tend to be on the up-and-up, but you’re also dealing with shrewd storytellers who like to play with the margins of an honest answer. For instance, they mentioned to EW that there would be three deaths in the finale. Isabel Rochev is, obviously, one. Could the other two be the believed deaths of Sara and Slade in the past timeline? The intimation with one of the only true cliffhangers of the episode is that Quentin Lance might have lost his life to one of the Mirakuru soldiers, dropping to the ground with significant internal bleeding following his altercation in the police precinct. Though the loss of Paul Blackthorne would surely be sad, especially as he turns in a sort of subversively commanding performance as the bedrock for the ragged police force — the hothead cop becomes the voice of reason and empowerment — the death of Quentin fits the closing of this particular chapter. There is sort of a poetic quality to the fact that all of the main parent characters would be off the show next season, save for John Barrowman’s Malcolm Merlyn, quickly promoted to a series regular for next season following the close of this season. It’s an evolution and a new story for our characters and losing Quentin for Laurel could be a strong catalyst. Barrowman [finally] becoming a regular dovetails perfectly with his appearance in the final two episodes of the season. As much as Oliver had stripped from him, Thea had even more. Not only did she lose her mother, but her very reality was altered upon learning that she was the product of an illicit affair between Moira and Malcolm. (Can it really only be months since “State v. Queen?” Honestly, this season was so dense that those early storylines feel like another season, another lifetime ago.) Having to come to grips with her mother’s role in the Undertaking, all the ups and downs with Roy, the thing she’d poured her existence into all year (Verdant) ripped from her, and then to find out her birth father was the deviant mastermind behind that wretched attack on the city. She lost her nurturing father, Robert, all over again, and also her brother as she believed he’d held the secret from her for years, something Oliver didn’t dissuade her from believing. Her own blood brother, a man she’d once held an attraction for, was stolen from her before she got to know him as kin. Then, her mother slain before her eyes because of her other brother. Everything about Thea’s life was, perhaps, more destructive to her than the boozing and drugs and partying she’d been doing when we were first introduced to her. Captivating then, that it should be Malcolm who comes to her rescue, both in the physical danger of the attack on the city and as a lifeline for her emotional turmoil. Sort of an irony of next season, if the parents are being wiped off the board, is that parentage would seem to be a big theme that will play out. The most obvious of that will be the birth of John Diggle’s child — dollars to donuts it’s a son that he and Lyla name Andrew — likely at some point near the winter hiatus. This is a tremendous development for both, as they frequently put themselves in harm’s way in their day-to-day lives, and this will obviously impede or alter that in significant fashion. That’s if Lyla manages to escape Amanda Waller’s doghouse for staging a coup, even though the results turned out favorable. There didn’t seem to be any immediate threat of that in the brief coda at the end of the episode with Team Arrow on Lian Yu, but one has to figure that Waller won’t let that go lightly. And, Waller would seem to play a considerable role in Season 3, perhaps in the present as much as she will appear in the past flashbacks. In any case, seeing Diggle tackle fatherhood will be an intriguing dramatic thrust, especially in relation to Team Arrow. It’s also safe to assume that the massive thread dropped in “Seeing Red” about a 7- to 8-year old child of Oliver’s will be picked up if this next generation angle comes to fruition. In one of his pre-finale interviews, Stephen Amell equated the fight in the tunnel to one of the field fights from the movie Braveheart, and there’s this wonderful meter to it as the Arrow’s group and the Mirakuru soldiers advance on each other that mimics that rhythm, if not quite the scope, very well. It’s a gorgeous action sequence that gives each of our heroes a chance to shine, while also giving us a bit of harrowing eye candy to enjoy. The stunt and choreo crew stepped up their game, with each fight offering a bit of a different flavor but the trademark chaos that’s come to typify Arrow‘s action. All was beautifully sewn together behind the team of John Bering and DP Glen Winter, who are quickly coming to define the aesthetic that is the show. Behring has directed more episodes of the series than any other, including four episodes this season, and my praise for Winter’s gift of color, composition, and lighting goes without saying. Of singular note is the sumptuous shot of Oliver and Felicity on the beach of Lian Yu with the sun-speckled bay water framed behind them. It recalled some arresting shots earlier in the season when Oliver and Shado were together before her death, and it’s nice to see something tonally very different than we usually get out of the show. That fed perfectly into the bright and colorful world of Hong Kong as revealed in the final seconds. This is a new world, a new color palette, a new set of rules. That, if anything, signified that what we’d come to know of the show through Starling City in the present and Lian Yu in the past — dark, wet, repressive, brutal, unforgiving, needing saving and redemption — was giving way to a whole new chapter. While there were solid and terrific performances throughout the hour and all should be commended, this really was a showcase for Amell and Manu Bennett. As it should have been, given that everything this season was in service to the Oliver vs. Slade diametric opposition. Amell really learned of and took advantage of working in small, raw spaces throughout this past year, and one of the particular joys of the series was in seeing how inward and reflecting his acting became as the outward stakes Oliver faced grew increasingly more daunting. It was subtle and altogether affecting work, and he shone throughout the finale in all manner of levels he was tasked to go. Bennett was burdened with the somewhat unenviable duty of painting Slade in varying degrees of anger and madness, and he did so with an underlying sense of dread and determinism that really lent an all-or-nothing cost to the second half of the season and this finale. It truly felt like Slade was not going to get out of this alive, and that it was simply a matter of how much he was going to burn down with him. Imagine my thrill that Slade was spared and that Deathstroke certainly hasn’t put in his last appearance in the Arrow version of the DCU. Most important between these two was the communion and brotherhood they’d build over the last year-and-a-half. It’s a rather extraordinary thing as they really weren’t given all that much screen time as that length would suggest. Though we got snippits of his past, there wasn’t a whole lot of information presented to build the meatiest of characters around Slade Wilson, and yet Bennett gave us someone fully-formed, fully-inhabited, and that allowed these two to engender this bond with the import and emotional resonance it needed to drive home the meaning of this relationship. That’s what really sold that final exchange between the two and solidified how irreconcilable this connection had become. All in all, it was such a different dynamic than the adversarial role Oliver shared with Malcolm, and the ultimately tragic friendship he had with Tommy. That gave a far different flavor to the closing hour this year as opposed to last year, and the series is better for that kind of diversity. Quite unlike the first season finale, which was the wham-bang, cliffhangery, story-altering episode that we expected, this time around was all about resolution. This was taking care of business rather than spinning us off in dizzying fashion leaving us fretting all summer about what was going to happen to someone or many next. It’s a bold choice and the most appropriate one. It plays out a bit more straightforward than anyone could’ve anticipated, and yet that offers each character a chance to move well into the next phase in their life. What did Diggle and Roy hold onto to slide down the cable during the escape from the clocktower? The sound editing would have you believe there were some kind of handholds, but they clearly appear to grab it with their bare hands. Nice reintroduction to Lyla with the RPG taking out the clocktower. That was a like a full-on, live-action G.I. Joe moment. Where is Sin? I know she must’ve felt abandoned by Sara when she split town a few episodes ago, but did Sin bug out of town, as well? If not, why was she nowhere to be seen during the finale? Oliver handing a red mask to Roy was a fun geek-out moment, though it’s a bit of a stretch to think Roy was trained properly to be effective out there. Every time his training was shown while on the Mirakuru, it was far from going well, and that’s not even counting the borderline psychotic rage that his was always on the edge of tipping over into. That said, that brief shot of masked, hooded Roy, for all intents and purposes Red Arrow, was fantastic. They established a very interesting motif with Sara and ships. Bookending her disappearance on the Queen’s Gambit in the pilot with a very similar shot of her sliding out of the sinking Amazo, leading Oliver to believe once again that she’d died. Then, her path out of town is on a boat with Nyssa and the League members instead of a plane or riding a motorcycle out of town again. Should Quentin’s bruising have been on his left side, as that was the side that slammed into the shelving that he was thrown into? Surprising that they took Isabel out of the show by killing her off. A point needed to be made in bold underline of the difference between Nyssa and Oliver, but it also creates a power vacuum at the head of Queen Consolidated. Perhaps an in for Oliver with the board next season. With Oliver now off the island, and seeing how bedraggled he becomes just prior to his rescue from Lian Yu at the end of the five years in exile, are we to assume that he never shaves or cuts his hair now that he’s in Hong Kong? One of the big questions left, at least for Diggle, is what is H.I.V.E. and why did they want his brother dead.